#8 "10 New Scenarios, New Maps and Counters"
Included for there popular All Things Zombie is a Battle Report by Norm Lunde and two scenarios, one of which uses new counters drawn specifically for this issue. The science fiction and horror segment of the magazine doesn’t end there. They have an extensive preview of there upcoming solitaire game, Space Infantry, a look at combat in House of Spirits, and a glimpse at Zombie War. To top it off they got some tips of strategy for Victory Point’s science fiction game, Forlorn Hope, and an interview with Alan Emrich. But it’s not all about fictional science. We got strategy for Tank on Tank, an historical article on Vietnam, the 911 on Sweden’s Forces in Operation Garbo, and a bit about combat in Britain Stands Alone. 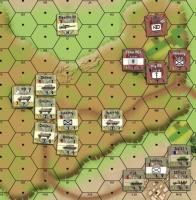 There is also a nice Corps Command Totensonntag Battle Report. Additionally, there are scenarios for Island War Deluxe, Lock ‘n Load, All Things Zombie, Tank on Tank, Dawn’s Early Light, and World at War. Ice that cake with 88-die cut counters (in the professionally printed version), a World at War map, a Lock ‘n Load/All Things Zombie map, and you have the makings of some serious fun. 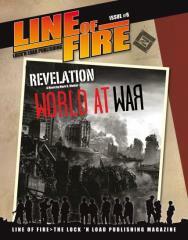 Line of Fire is a professionally printed magazine with 88 die-cut counters, and two card-stock maps. Over 61 pages of gaming goodness. Have it your way…professionally printed with die cut counters and cardstock maps. 10 new scenarios for World at War, LNL, ATZ, Tank on Tank, Dawn's Early Light, and Island War! Counters include South African, Cuban, and FAPLA counters for World at War, new tanks (King Tiger) for Tank on Tank, an early ATGM for Lock ‘n Load, and a couple of ATZ weapons. Maps include South African World at War map, LNL shoreline map.